A priest and a taxi driver both died and went to heaven. 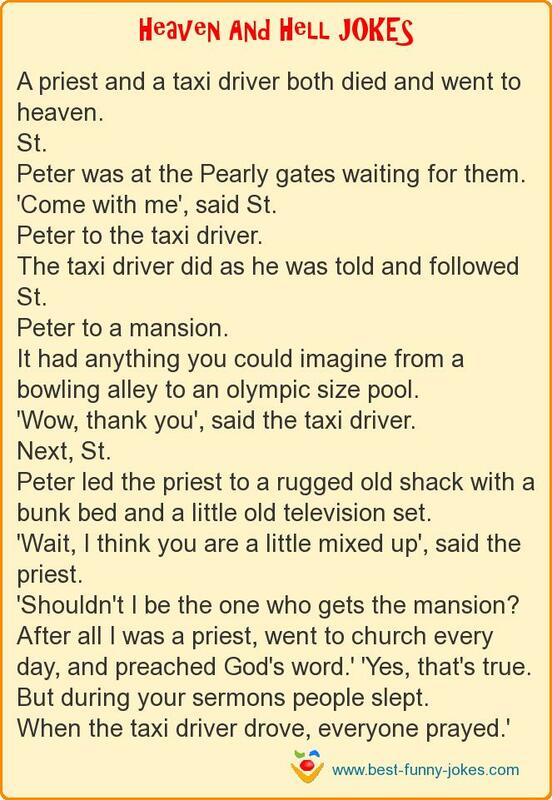 'Come with me', said St.
Peter to the taxi driver. The taxi driver did as he was told and followed St. It had anything you could imagine from a bowling alley to an olympic size pool. Peter led the priest to a rugged old shack with a bunk bed and a little old television set. 'Wait, I think you are a little mixed up', said the priest. 'Shouldn't I be the one who gets the mansion? After all I was a priest, went to church every day, and preached God's word.' 'Yes, that's true. But during your sermons people slept.